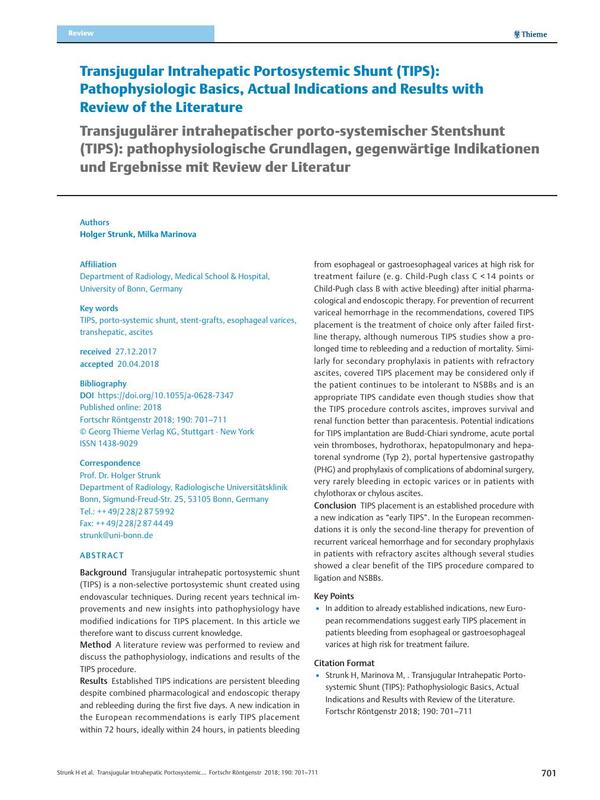 Background Transjugular intrahepatic portosystemic shunt (TIPS) is a non-selective portosystemic shunt created using endovascular techniques. During recent years technical improvements and new insights into pathophysiology have modified indications for TIPS placement. In this article we therefore want to discuss current knowledge. Method A literature review was performed to review and discuss the pathophysiology, indications and results of the TIPS procedure. Results Established TIPS indications are persistent bleeding despite combined pharmacological and endoscopic therapy and rebleeding during the first five days. A new indication in the European recommendations is early TIPS placement within 72 hours, ideally within 24 hours, in patients bleeding from esophageal or gastroesophageal varices at high risk for treatment failure (e. g. Child-Pugh class C < 14 points or Child-Pugh class B with active bleeding) after initial pharmacological and endoscopic therapy. For prevention of recurrent variceal hemorrhage in the recommendations, covered TIPS placement is the treatment of choice only after failed first-line therapy, although numerous TIPS studies show a prolonged time to rebleeding and a reduction of mortality. Similarly for secondary prophylaxis in patients with refractory ascites, covered TIPS placement may be considered only if the patient continues to be intolerant to NSBBs and is an appropriate TIPS candidate even though studies show that the TIPS procedure controls ascites, improves survival and renal function better than paracentesis. Potential indications for TIPS implantation are Budd-Chiari syndrome, acute portal vein thromboses, hydrothorax, hepatopulmonary and hepatorenal syndrome (Typ 2), portal hypertensive gastropathy (PHG) and prophylaxis of complications of abdominal surgery, very rarely bleeding in ectopic varices or in patients with chylothorax or chylous ascites. Conclusion TIPS placement is an established procedure with a new indication as “early TIPS”. In the European recommendations it is only the second-line therapy for prevention of recurrent variceal hemorrhage and for secondary prophylaxis in patients with refractory ascites although several studies showed a clear benefit of the TIPS procedure compared to ligation and NSBBs. In addition to already established indications, new European recommendations suggest early TIPS placement in patients bleeding from esophageal or gastroesophageal varices at high risk for treatment failure.